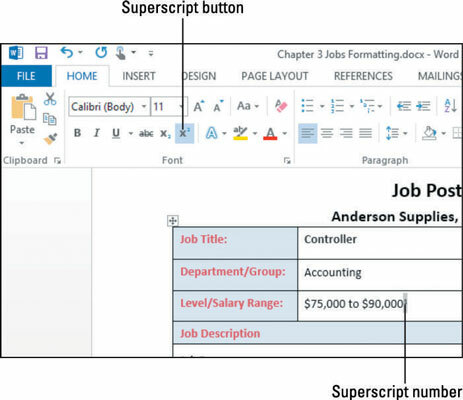 Word 2013 allows you to customize a lot of different things in your documents to allow you the chance to make your document appear exactly how you envisioned it. One of the things you can customize is your superscripts and subscripts. You can change the vertical position of a character, moving it up or down in relation to the other characters around it. This is useful, for example, when you want to adjust the position of a superscript or subscript character. By adjusting the character position, you can increase or decrease the amount of raising or lowering. Superscript characters are raised a certain amount above the baseline, and subscript characters are lowered a certain amount. In a Word 2013 document in need of subscripts or superscripts, click to move the insertion point after the fist incident in need of a superscript. In this example, the first incident occurs after $90,000 on the third row of the table, and needs a superscript of 1. Select the 1 you just typed, and choose Home→Superscript to make the character smaller and raise it above the baseline. Note the position of the 1 in relation to the adjacent 0. Now the 1 is above, and smaller than the 0. 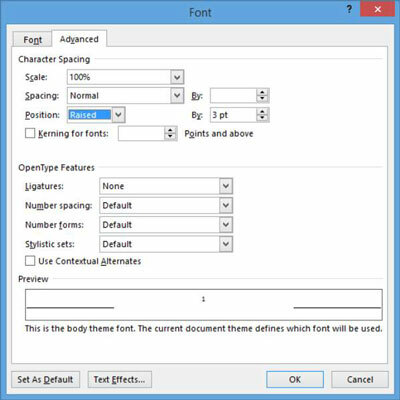 To customize the superscript of the 1, with the 1 still selected, click the dialog box launcher for the Font group, opening the Font dialog box. On the Advanced tab, from the Position drop-down list, choose Raised. In the By box, leave the default setting of 3 points as-is, and click OK.
Notice that the 1 is now significantly higher than the 0 adjacent to it. To customize subscripts, simply follow these directions again, but select lowered instead of raised.